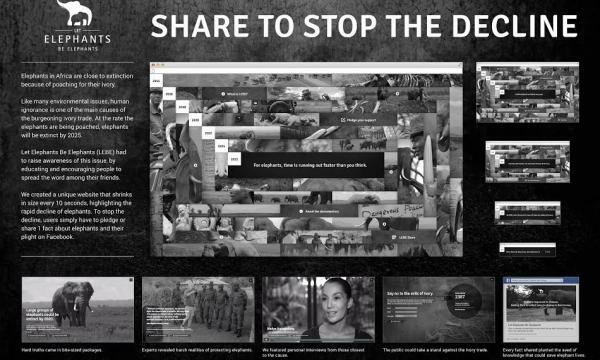 To raise awareness among Asian consumers that the high level of poaching that’s driven by Asia’s ivory trade will kill off African elephants by 2025, JWT Singapore created a unique website that shrinks in size every 10 seconds, highlighting the species’ rapid decline. Behind this project is, Let Elephants be Elephants (LEBE), an organization founded by TV host Nadya Hutagalung and elephant expert Dr. Tammie Matson which aimed at reducing the number of people buying ivory in Asia. Users pledge to share one fact about elephants and their plights from the LEBE website on the their Facebook page to stop the decline. Currently, there are over 6,781 people worldwide who have made their pledges against buying ivory. Part of this campaign is creating a documentary that highlights the connection between rising levels of elephant poaching in Africa and the consumption of Ivory in Asia, which aired on National Geographic. And just recently, the organization released the first of three webisodes which can be viewed through their youtube channel. The first webisode focuses on the plight of baby orphaned elephants at the David Sheldrick Wildlife Trust in Nairobi. The purpose of LEBE is to draw attention to this issue and to encourage all to take the pledge never to buy ivory. The campaign want any concern individual to share the facts to keep the elephants alive, know the truth about ivory, understand the consequences of ivory purchases and how long have elephants got left. According to LEBE, every 20 minutes, one more elephant dies because of ivory - that's 80 elephant deaths a day and 30,000 elephants killed every year. LEBE also indicated that we only have 11 years to make a change that’s why they call to share a fact or pledge to stop the decline.